Ideally, links in web pages protected by WebSEAL should be relative links. 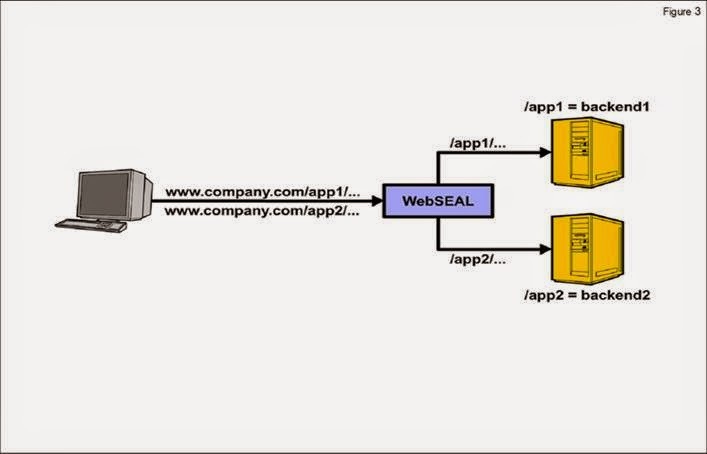 However, WebSEAL is usually deployed in situations where the back-end server is not under the control of the same group. Relative links do not contain the name of the server or the name of the current directory. When the browser receives a relative link, the link appears to be located on the WebSEAL server. Relative links are correctly interpreted as links to other pages in the same directory on the same server. The browser retrieved this page from https://webseal/Junction1/index.html. This URL is correctly interpreted as pointing to https://webseal/Junction1/about.html. This request would go back to WebSEAL and WebSEAL would know to request http://serverA/about.html. Server-relative links do not contain the name of the server, but they do contain the name of the directory. The browser retrieved this page from https://webseal/Junction1/index.html. This URL is interpreted as pointing to /contact.html on the same server.However, from the browser’s perspective the server is WebSEAL. If WebSEAL did not change the HTML, the browser would attempt to retrieve https://webseal/contact.html instead of the correct URL, which is https://webseal/Junction1/contact.html. Absolute links contain the name of the server and the directory. If WebSEAL did not change the HTML, the browser would attempt to connect directly to ServerA, bypassing WebSEAL. A correctly configured firewall would only allow connections to ServerA from WebSEAL. a. Server-relative links are modified to include the current junction name. b. Absolute links might or might not need modification. Only links to WebSEAL protected resources must be modified. WebSEAL changes the links to protected resources into server-relative links (by default) and adds the proper junction name. If the links are for external sites, WebSEAL does not change them. The first link will not be modified because it is server-relative. The second link, http://ServerA/bad.html, will also not be modified because WebSEAL will not be able to identify that it is a link. The string http://ServerA/fun.html will be modified even though it is not a link. 3. Create a junction with the junction cookie enabled (-j from the command line). 1. 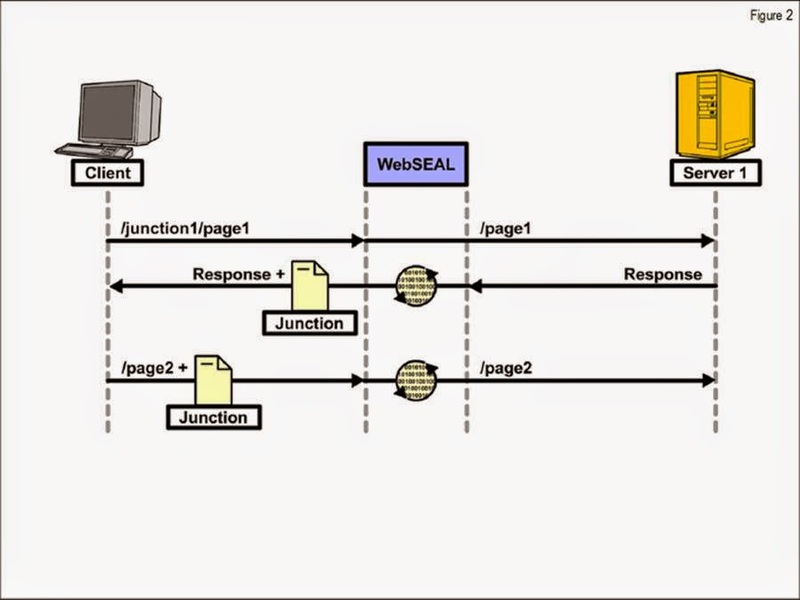 Open a page using a junction that has junction cookies enabled, The junction cookie is set to Jct1. 2. 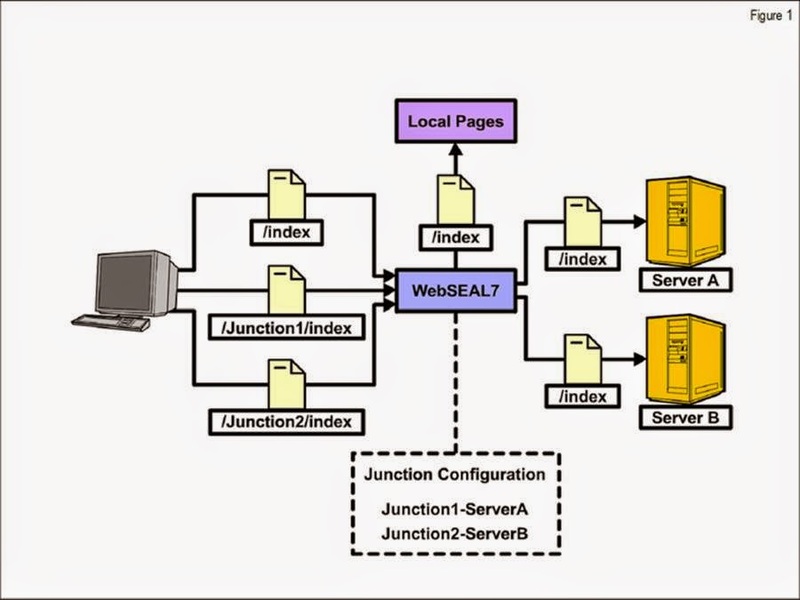 In the same browser, open another window for a different junction on the same WebSEAL server, which also has junction cookies enabled, The junction cookie is set to Jct2. 3. When you return to the original window and click a link, for example to /page2.html, the cookie is set to Jct2. WebSEAL will attempt to retrieve /page2.html from the server for that junction, instead of Jct1. The junction mapping table is a text file that contains junctions and regular expressions. When WebSEAL looks for a junction, it tries to find which regular expression in the table matches. The junction mapping table is located in /opt/pdweb/www-default/lib/jmt.conf by default. This file name is specified in the instance configuration file and can be modified as needed.